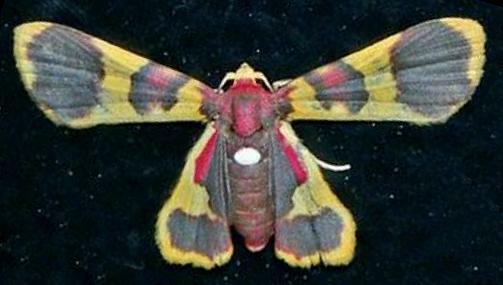 The adult moth of this species has yellow wings with black and red markings. There is a prominent white spot on the abdomen. The moth rests normally with the fore and hind wings disconnected. The wingspan is about 2 cms. LeapFrogOz, Kuranda, 2015, p. 112. Volume 32 (1908), p. 63. A Guide to Australian Moths, CSIRO Publishing, 2007, p. 189.